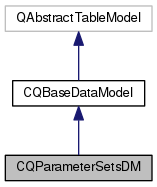 Definition at line 18 of file CQParameterSetsDM.h. Definition at line 17 of file CQParameterSetsDM.cpp. Definition at line 22 of file CQParameterSetsDM.cpp. Definition at line 32 of file CQParameterSetsDM.cpp. Definition at line 37 of file CQParameterSetsDM.cpp. Definition at line 61 of file CQParameterSetsDM.cpp. References COL_NAME, COL_ROW_NUMBER, FROM_UTF8, mpListOfParameterSets, and rowCount(). Definition at line 42 of file CQParameterSetsDM.cpp. Definition at line 86 of file CQParameterSetsDM.cpp. Definition at line 148 of file CQParameterSetsDM.cpp. References ListViews::ADD, ListViews::LAYOUT, mpListOfParameterSets, CQBaseDataModel::notifyGUI(), and CCopasiVector< T >::size(). Definition at line 143 of file CQParameterSetsDM.cpp. Referenced by CQParameterSetsWidget::slotDoubleClicked(), and CQParameterSetsWidget::updateDeleteBtns(). Definition at line 201 of file CQParameterSetsDM.cpp. References C_INVALID_INDEX, CQMessageBox::confirmDelete(), FROM_UTF8, CCopasiObject::getObjectName(), mpListOfParameterSets, and CQBaseDataModel::removeRow(). Referenced by clear(), and CQParameterSetsWidget::deleteSelected(). Definition at line 166 of file CQParameterSetsDM.cpp. References CCopasiVector< T >::begin(), ListViews::DELETE, CCopasiObject::getKey(), ListViews::MODELPARAMETERSET, mpListOfParameterSets, CQBaseDataModel::notifyGUI(), and pdelete. Definition at line 25 of file CQParameterSetsDM.cpp. References mpListOfParameterSets, and CCopasiVector< T >::size(). Referenced by clear(), data(), CQParameterSetsWidget::deleteSelected(), and setData(). Definition at line 113 of file CQParameterSetsDM.cpp. References COL_NAME, COL_ROW_NUMBER, mpListOfParameterSets, and rowCount(). Definition at line 240 of file CQParameterSetsDM.cpp. Definition at line 46 of file CQParameterSetsDM.h. Referenced by data(), insertRows(), removeRows(), rowCount(), setData(), and setListOfModelParameterSets().